He also has a more easily digestible version on the arxiv, titled “Shut Up and Calculate”. Since the guy is quite entertaining, it is worthwhile to check out the recording of his colloq at PI, and the talk at the Many Worlds at 50 conference. B) “A mathematical structure is […] abstract entities with relations between them.” And that MUH applies “With a sufficiently broad definition of mathematical structure". Conscious beings like us appear within the mathematical universe as a specific kind of self-aware-substructure (SAS), that however has to cope with the problem of not having an overview on the whole universe. He calls that the ‘frog view’ and the ‘bird view’. Indeed, I think of my job as describing reality with the use of mathematics. Therefore I find Tegmark’s hypothesis a bit disturbing. Despite (or maybe just because of) this, I find it also interesting. However, there is a good reason why I would say mathematics describes reality rather than it is reality. To use a well known example, think of us as frogs in a cave with a fire where we can see only the shadows of ‘real’ things on the wall, like e.g. dancing Gods. Some of us frogs try to describe and understand these shadows, and we find drawings quite useful. After centuries of practice we get really good with the drawing. Since all the frogs sit on slightly different places, their drawings used to depend on their perspective. But after a lot of croaking they find a way to get rid of this froggy baggage. A couple of bright frogs even come up with interesting theories that make their drawings better descriptions of reality. E.g. they might invent some kind of interaction between the dancing Gods that explains a lot of seemingly odd behavior. Now one of the frogs says these drawings are not descriptions of reality, they are reality. Quack, quack, quack, go the frogs. Obviously that can’t be. We can draw a lot of things that never appear on the walls. Either our thoughts are not real. Which I could try to read out of Tegmark’s sentence “We humans can imagine many things that are mathematically undefined and hence do not correspond to mathematical structures”. This however would mean that the whole idea of the reality being mathematical is based on something not being real and mathematical, i.e. our thoughts. Which doesn’t give much credibility to hypothesis that mathematics is all of reality. Bottomline: MUH is founded on our ability to think of mathematical structures. Yet circumvents to explain the ‘real’ difficulty, namely the relation between thoughts and reality. This relation however is essential to the credibility of the hypothesis to begin with. The open question remains whether there is ‘real’ mathematics (drawings of shadows) and ‘pure’ mathematics (drawings without shadows). To show that MUH has to follow from ERH, it is necessary but not sufficient to claim that mathematical structure is ‘with no baggage whatsoever’. One needs to know it is the only thing that can exist independent of human baggage. I further have a problem with the reasoning of ERH implied in the word ‘independent’. We humans exist. If physical reality is a mathematical structure i.e. MUH holds, our existence has to follow from it – probably as kind of an emergent substructure. If it did not follow, physical reality was different, namely without us (you belong to my external physical reality). Thus, physical reality is not independent of us humans. Ergo, from MUH follows not ERH or from ERH follows not MUH. You might call that nitpicking on words. It is. But it brings out the obvious fact that humans can not reliably state a formulation of reality which is independent of human ‘baggage’. The idea that we can do so is, well, an illusion. I.e. not ‘real’. Call that cognitive bias or The Principle of Finite Imagination. Bottomline: Mathematics being without human baggage does not imply it is the only thing independent of humans, and therefore must constitute external physical reality. He argues that we should take Darwin seriously and take into account that evolution did not train us to understand the universe, and that a fundamental description of reality therefore ought to seem odd and unintuitive to us. Interestingly, the very base of his hypothesis is that we humans are indeed able to grasp the foundations of reality, and that mathematics is the end of this leveling. Can we possibly describe everything about the electron with mathematics? Can we ever be sure we describe everything about the electron? What is reality? The idea of loosing human ‘baggage’ with using mathematical calculus is nice. But it ignores the fact that my - and I believe also Tegmark’s brain - is entirely human. To date nobody has given a definition of mathematics that is not filtered through what our brains are capable to do. Bottomline: We have no reason to believe that our brains are capable to grasp fundamental reality. I like to think of the the universe being very well described by mathematics. That must not necessarily be a description by an evolution equation. I can imagine a mathematical description that just ‘is’ (and time is an illusion anyhow). That is to say the fundamental law might just not be a differential equation. However, us being frogs means we sit somewhere inside this universe. The question we will typically ask is not ‘where are we?’ – which would then allow us to explain everything around us – but ‘how do I get from here to there?’. That is we are asking for a differential equation, a propagator, an evolution law. We measure here and now, apply our law, and get there and then. We have done that for centuries, and it works quite well. It requires however initial conditions. So this procedure might fail if we’re up to describe something like the whole Froggyverse. Instead, we could ask ‘where are we?’ and try to go beyond an evolution law. For this one doesn’t need to assume MUH. However, we might have gotten rid of the initial conditions, but instead we now need to specify our location. The argument is then the familiar one: since everything ‘is’ somewhere, one doesn’t need to specify anything. Just that instead of finding the Lagrangian for the TOE we now need to find a measure that explains why we are ‘where’ we are. So to me it doesn’t solve any problem, it just puts the frog into a bird’s perspective. However, a different perspective can turn out to be useful nevertheless. Bottomline: Interesting way to get rid of the initial conditions that could turn out to be useful, but does not depend on reality being mathematical. Despite the impression that you might have gotten I like Tegmark’s hypothesis because it is quite minimalistic. Usually we deal with mathematics but only part of it is ‘applied’ to reality. We have maths, and we have a reality, both of which needs to be specified. If both was identical one could drop this additional complication. I also find the idea really neat that every time I make up some mathematical ‘relations’ between ‘abstract structures’, I am actually describing a real universe – somewhere. However, I see my task as describing the universe around me. I have little doubt that for some while mathematics will remain useful for this, and I don’t think whether or not mathematics is real makes a practical difference . I just don't find the hypothesis that reality is mathematics well motivated, since it is evidently constructed by humans. We have no reason to believe that this approach is indeed independent of human baggage, neither do we have any reason to believe it is the only way to describe reality. It is nevertheless an interesting hypothesis, and might indeed lead to some insights. Sometimes a change of perspective is all it takes to make frogs fly. I want to point out that the question whether or not reality exists is not subject of discussion, but a more or less plausible assumption. I.e. unless you can prove or disprove the existence of reality, please spare me the comments. I could imagine that self-aware structures do carry around local versions of maths space with simpler structures. Except for a headache possibly. Ah, sorry. That's Germenglish (the German word is 'quaken'), I'll change it, thanks. -B.
I thought you might be mixing up the bird view with the frog view? 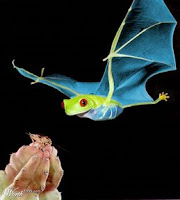 Do flying frogs quack instead of croak? Which brings me back to the "imprisoned views" we have and how we are chained. Shadows are caused by something greater then what the shadow is of itself. You are trying to define whether "the line is of the shadow" or "the light?" The greater context is that the fire, "is beyond, or outside the cave." "The sun," symbolically. That is "the universal connection?" "All math" emerges out of that? I think the point of MUH is mathematics is not emergent. I'm just a figment of my imagination... so you're not even arguing with you when you talk to me... ... ... er???? Geez... froggyverse... bloggyverse... 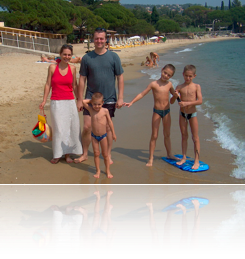 There's a veritable multiverse right here in Bee's blog! Max' stuff is always interesting, but I never find much that I personally would consider to be a "real" reflection of nature. Reality exists One example, 10^1000 untestable candidates, plus religions and their schisms. In the whole of human history across the entire planet not one deity has volunteered Novocain. It is a telling omission. Quantum mechanics assures that faith is microscopically operative and macroscopically crap. Add Gödel's incompleteness theorems. Hope for the best; engineer against added not averaged tolerances. Vote for causality but beware statistics of small numbers. The universe is built upon deep symmetries. All its interesting aspects are symmetry breakings. A fundamental understanding must therefore accommodate its own contradiction. Mathematics is not empirical. Physical theory is the Buddha on the road. Ponder that, padawan, as experiment. I wrote about Dr Tegmark's ideas a while ago. In my opinion, he describes a rather unconvincing modern equivalent of "I am that I am", and he does so by taking a number of intellectual shortcuts. Thanks for this interesting and entertaining post. Perhaps Tegmark has discussed these issues in his paper(s), but two difficulties with his approach as you describe it are readily apparent. First, ERH is actually very problematic. If "we humans" and "external physical reality" make up the totality of all that there is, there is no other totality to compare with, and it is not all that clear that one part of the totality that we have is or can be "completely independent" of the other part, whatever that might mean. Could "external reality" exist completely independently of galaxies? or calcium carbonate? I would want to ask what "we humans" means - a particular species of ape found in a particular tiny corner of space-time, or all self-aware beings capable of mathematical reasoning, or what? Second, MUH is very imprecise and is in danger of either naively ignoring a century of incompleteness results in mathematical logic or making the word "exists" meaningless (I am reminded of Bill Clinton's equivocating on the meaning of the word "is"). Is the real number line part of external reality? If so, I would like to know whether or not it "really" contains infinitesimals. Is some form of set theory part of external reality? If so, I would like to know whether the Continuum Hypothesis is true. 5) the universe beyond maths (you mean that cannot be described mathematically?) - are thoughts formulated? - just a play on words. Geeesus, I guess one can number the heart beats in an average life time, or even in each individual life time - after all isn't it said that "every hair on our heads has been counted" - easier to count the less (hair) we have. Testing Einstein: Is Dark Energy Constant? I think pro/opponents of the paper can be drawn down the line between those who believe mathematical structures are something to be "invented" or something to be "discovered". The latter implying that the existence of objects and rules exist outside the realm of human thought. If this in addition to ERH is assumed, does it not completely remove ones ability to use the word "thought" in an argument against the corollaries? The fact that we cannot make an electron "real" just by thinking about it follows simply from the fact that such an action violates one of the axioms of the universe. I feel like Dr. Tegmark is tacitly using this "sufficiently abstract definition of mathematics" to his advantage in a way that makes the whole argument very difficult to refute. Gee, even my multiple disordered personalities are not what they ought to be. I think I shouldn't have stopped taking these pills ;-) Yeah, I find the word 'multiverse' just involuntarily funny, it depicts very nicely the absurdity of the idea. If the universe already is 'the whole cosmos' 'all together', then the multi/ disney/ froggy/ bloggy -verse doesn't exist. If somebody spent as much time thinking about my papers as I spent thinking about this paper, I'd be happy! Overall seen I find the paper on the mathematical side empty, on the philosophical side weak, and on the physical side vacuous. The combination of the three makes it interesting, and it is worthwhile reading because he has made an effort to put his proposal into perspective with other, related problems. I just honestly don't see what it can possibly be good for. "The MUH makes the testable prediction that further mathematical regularities remain to be unconvered in nature." (which however is an prediction of arbitrarily many other theories as well, and doesn't 'test' whether 'reality is mathematical'). "A second testable prediction of the MUH is that the Level IV multiverse exists, so that out of all universes containing observers like us, we should expect to find ourselves in a rather typical one." To begin with I just don't find it very pretty to have a theory that predicts an infinite amount of stuff that however by construction is completely unobservable. Besides, this 'prediction' is empty without specifying 'rather typical' etc, there come all the problems with the measure. Now tell me a sensible measure on the space of mathematical structures? And yes of course there are then the further problems like what is life, or call it a SAS. It's nice to invent the word, but it's not helpful in a pragmatic way. However, I should have added the paper addresses Gödel incompleteness and other critique on p. 17. I would say "is described by a mathematical structure", so I fall off the Tegmark argument right there. Let's start with a limited universe - say the game of chess - and ask whether we get any insight into chess by saying "it is a mathematical structure". If the universe is a mathematical structure, what is the role of computation in this universe? What I'm thinking is of, but unable to articulate is that it is I think possible to set up physical systems a reasonable simulation of which would take up computing machinery that would require more atoms than there are in the universe (that we observe). How does the "mathematical structure" work to produce phenomena? We know the laws of physics sufficiently exactly to write down the "mathematical structure" that represents a protein molecule in an aqueous medium. Why is it so easy for the "mathematical structure" that is the universe to figure out how the protein molecule will fold and so difficult for our mathematical structure? At best, I think the Tegmark side could argue that there are different realizations of a mathematical structure; but then they lose the argument - our reality is a particular realization of a mathematical structure, and bears only passing correspondence to our mathematical laws of physics. In particular what is the mathematical property of the mathematical structure that implies existence (in our branch of the multiverse)? If there is no such property, or there is such a property but it cannot be determined, then I'm left with no alternative but to deal only with what I can determine experimentally. Tegmark's "mathematical structure" is pie in the sky. If there is such a property and it can be determined, then existence to me is "that part of mathematical structure that has the property, belongs in our branch of the multiverse". The rest is not of interest to a physicist. I think pro/opponents of the paper can be drawn down the line between those who believe mathematical structures are something to be "invented" or something to be "discovered". The latter implying that the existence of objects and rules exist outside the realm of human thought. If this in addition to ERH is assumed, does it not completely remove ones ability to use the word "thought" in an argument against the corollaries? Well, the obvious fact is that all our arguments are thoughts, so you hardly can get rid of them ;-) The argument I have given which you are referring to - the one which involves thoughts - is not actually 'against' the corollaries, but about the motivation for the hypothesis to begin with. I used it just to explain why I think most people would disagree on the proposal that 'reality is mathematics'. I also do not think the line is drawn at whether mathematics is a discovery or an invention. I too tend to believe mathematics is a discovery, and 'exists' in some sense outside of human thought. However, as I have argued above - without referring to any thoughts - this does (in contrary to what Tegmark claims) not imply that reality is entirely mathematical. Just because we don't know of any other good 'discovery' without 'human baggage' does not mean there is none. In fact, this conclusion of Tegmark is evidently a construction of human 'thought' that might just not be able to grasp other 'discoveries' without 'human baggage'. The fact that we cannot make an electron "real" just by thinking about it follows simply from the fact that such an action violates one of the axioms of the universe. Yes, of course. But that would be exactly the point to clarify. What is different about the structures that I can think of, and the one I attempt to describe, what are the axioms of our universe, isn't that exactly what we are looking for? And if most of the structures that I can think of evidently are not the ones that constitute external physical in 'my universe', then why should I believe they are real elsewhere? But what one would actually want to know is what axioms allow for SASs? That might be a way in which one could get something out of this hypothesis, but on this stage it seems to me much too vague to be useful for anything. "Very interesting. Thanks for the links. I just met another mathematician (a pure mathematician like me) who also believes that proof is a social value, and that mathematical objects have no existence outside our minds. Looks like it is not heresy any more :-)." At the origin (0,0), construct a circle with a radius representing c as a vector. All rays from the origin may be considered as vectors of c.
Focus only upon the x and y axes. In all four quadrants, draw the hypotenuse from the end of each vector c on the x to the y axis, to construct a circumscribed square. Note that each hypotenuse is equal to c*2^(1/2) from Pythagoras. Each hypotenuse may represent a scalar relative speed. Circumscribe the original circle within a square where both the x and y axes bisect the edges, each of length 2c, of this square. This is a step in how Archimedes attempted to determine the value of PI by maximizing the perimeter of a regular polygon within and minimizing the perimeter of a regular polygon outside the circle. From the above construction, with m=1: (1/2)*(c*2^(1/2))^2=c^2. This is apparently the energy E obtained by Einstein when m=1. Yet the maximum relative speed from -x to x or -y to y is 2c. If Einstein had used this value then maybe E would equal 4c^2. This appears to suggest that c may be “constant extrema” rather than merely a constant. A good puzzle - is Sherlock Holmes a mathematical object? See this and surrounding posts for context. This post suggested a peculiar question to my mind: In the multiverse, are there universes based on incorrect math? 1)Reality exists "Physically and Virtually". 1) External Reality Hypothesis:"There exists an external physical reality,completely independant of us Humans". 1a)There is unknown maths, out of reach of human brains! This implies 'Mathematical Universe Hypothesis". 2) M.U.H "Our external physical reality is a mathematical structure"
2a)The "maths real", external to human thoughts, treats a part of its structure (HUMANS), as a virtual/unreal quantity, thus if external maths are the only reality, then humans must be "virtual" to the Universe, this contradicts the Human thinking of Quantum Mechanics whereby everything "external" to humans is actually the virtual quantity? Math is to me, as I am to math?..I calculate, therefore am I the Universe? Max Tegmark paper is really thought provoking, but one can extend some insights to mathematical structures and "their" reality, for instance, the Electron that shrouds a Proton for an Hydrogen Atom to exist, can have it's existence questioned from the protons view (not the human observer external to them)..does the Proton view it's existence as being within an Electron? Think about it a little, when the Electron is attached to the Proton, as far as the Proton determines, there is "nothing" outside of the Electron, as far as the Proton goes, it exists WITHIN the Electron! When the Electron detaches itself from the Proton, the Proton can determine that it exists EXTERNAL to the Electron! One can ask and answer logic (see Arun's link of 06:49)..but one can always avoid the issue's altogether, and blame oneself for not finding a suitable answer, on the mathematical intepretations? Ah, Bee, in order to use the royal "we", I think multiple personalities are a requirement, Your Majesty! If the universe already is 'the whole cosmos' 'all together', then the multi/ disney/ froggy/ bloggy -verse doesn't exist. Exactly, and I think that this sloppiness is just an example of a deeper tendency... or whatever, anyway, I'm sure that Dirac would freak about a lot of stuff. Your analysis on that paper sounds more interesting than the paper itself. I only read the shorter paper ("Shut up and calculate! "), and was enough. I fear I did not put much energy in trying a thorough analysis as you did. Here is what I wrote over at my blog. "Apparently, his philosophy is to equate the physical world with mathematics (yes, equate, not a sort of mapping between the two). He argues that this direct equality solves many problems. Actually, he seems to argue that such an equality solves the philosophical problem of whether there is an ultimate reality. Yes, there is one and it is pure mathematics. And everything is revealed! Isn’t it obvious? I may have misunderstood it all (I’ve only read his shorter paper mentioned here). In any case, I didn’t find any of his arguments brilliant or convincing. Looks like a very bad philosophy to me. The fact that we can describe physical phenomena through mathematical reasoning is something much deeper to me and equating both is no solution (again, to me). It’s like turning a difficult question into a trivial one as the best way to actually avoid it." Bee:I think the point of MUH is mathematics is not emergent. I would think the mathematics had to "always exist" and that you are only discovering it by becoming aware. A bird's eye view even at this reductionist level. So it looks like it has been a long struggle for Max, judging by the quote? 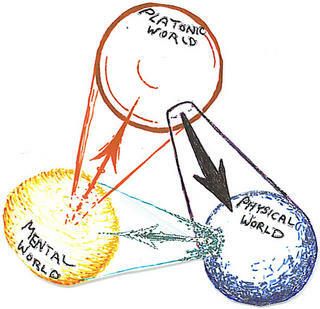 Imagine what Plato, my other personality :) would think, being so trumped for "some other model of the universe" like WMAP, a secured measure foothold on what reality is supposed to be? Versus nothing? What is nothing, therefore, I exist. "Gr" is a product of string theory? String theory is a view of the universe of much greater depth. String theory, is mathematically consistent? So "the light" is behind string theory and Veneziano understood this, as part of the universe? Before "this universe" became what it is? Cosmologists might say there is no before, yet, to think beyond the reductionist view of our colliders "string theory" was not mathematic inconsistent? By association and changing the way we see "the cave" does not reduce what is of value historically. Coxeter understood this in his work? Take away the euclidean and there is non-euclidean. Not nothing, but a different form of geometry. Be nice to see Garrett's thought on Coxeter. The fifth element, i.e., the quintessence, according to Plato was identified with the dodecahedron. He says simply "God used this solid for the whole universe, embroidering figures on it". So,I suppose it's a good thing that the right triangles comprising this quintessence are incommensurate with those of the other four elements, since we certainly wouldn't want the quintessence of the universe to start transmuting into the baser substances contained within itself! You might like Roger Penroses's picture? While we might be caught in this circle of events, it would not seem so unlikely that there is a "spiritual side" that could exist beyond the mental state? Progressive, outward, physical emotional, mental and then spiritual. This would have been a "inward journey" simultaneously express in this outward progression and understanding. 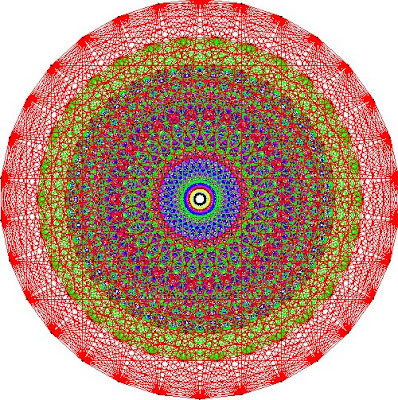 But crystals exhibit clear mathematical patterns of their own, such as a regular geometric form, and while nobody can deduce this in full logical rigour from the quantum mechanics of their atoms, there is a chain of reasoning that makes it plausible that the laws of quantum mechanics do indeed lead to the regularities of crystal structure. The "geometry exists in another form" before the physical crystallization. Studying Coxeter would help you understand this. Tegmark addresses the question of (un)computability in the longer paper, this is why he has different possible scenarios for mathematical structures. I find this an interesting aspect, but it's not actually his work (see references in the paper). Why is it so easy for the "mathematical structure" that is the universe to figure out how the protein molecule will fold and so difficult for our mathematical structure? And if it is so difficult for us why believe mathematics is the whole structure of reality? I just don't find his argumentation very compelling. Besides this there is the obvious point that so far nobody was able to explain the 'mathematical structure' of at least one consistent universe with self-aware-structures. Tegmark's "mathematical structure" is pie in the sky. :-) I'd say its all possible pies in a multiverse of skies. The 'speed' of light, as every other speed, is a scalar quantity, not a vector. Well. Luckily he didn't because the factor 4 is evidently wrong. :-) I think in Tegmark's version, no. Even though I don't believe in MUH, I too would say this can't work. In the sense that 'incorrect maths' isn't a 'base' for anything. To stick with the analogy above, it would be like trying to draw with a spoon instead of a pencil. Thanks for the link to 'Think Maths', looks interesting! I will give it a read if I find the time. You must know that The Fifth Element has read hair? 1) External Reality Hypothesis:"There exists an external physical reality, completely independant of us Humans". 1) Postulate: A exists with property B. 1a) C exists with property B. From this it does not follow A equals C. And this doesn't even address the question whether C actually has property B, what 'exists' means, or whether the postulate can be stated in a meaningful way to begin with. I have deleted your duplicate comment (if you use a blogger ID, you could do it yourself). Yes, I share your point of view. You say "Actually, he seems to argue that such an equality solves the philosophical problem of whether there is an ultimate reality". Well, it doesn't 'solve' anything, it just postulates it away, with a reasoning at least I find very unconvincing. Bee:You must know that The Fifth Element has red hair? Was any of what I wrote of Coxeter useful? Agreed c as the speed of light is a scalar. However when v -> c, as in limit theory and if v=c is obtainable, then v is a vector since there is direction from the origin. My exercise was an effort [perhaps flawed or even failed] in trying to determine how Einstein derived E=mc^2. From my feeble construction, it seems plausible that he determined that the maximum energy would occur when two vectors [each approaching c in speed] were orthogonal in travel, rather than 180 degrees in opposite directions, in his use of a speed for the relative velocity [or acceleration constant] of these vectors? I have not seen very many physicists embrace the concept of extrema which appears to be heavily used in engineering and linear and dynamic programming. scalar product in Minkowski space: m^2 = p^\nu p_nu = E^2 - p^2, set p = 0 for a particle in rest, fill in c's where they belong. Bee:I find the whole discussion, well, useless. I guess when I wrote in "art and communication" then it was appropriate? Also, that you were in good company with Hawkings, Hooft, Heisenberg. So if I read you right, not only Coxeter and Veneziano, but the listed gentleman as well. Here is my very naive problem with all statements pertaining to "existence": one can ask if the past or the future exists, if other branches of the wave function exist, if all mathematical structures exist (incidentally, why do they have to be internally consistent? ), etc. etc. ; But, is there any independent definition of the word "exist"? I can always define the word "reality" to include or exclude anything I want, it is just an exercise in semantics. What is the non-trivial statement in the MUH? is there one? here). The letters are not supportive and agree with you: "Some of us think the opposite far more likely: that logical/mathematical truth is subordinate to the physical facts of the universe." I considered this mathematical reality idea on my own site (see here), but again I got rather disillusioned with it the more I looked at it. Stanislas Dehaene called the whole thing a "cognitive illusion": "My own neurobiological interpretation is that Platonism is a cognitive illusion that imposes itself upon so many great mathematicians because with training, their brains develop a vivid, seemingly real, internal image of mathematical objects. Presumably, one can only become a mathematical genius if one has an outstanding capacity for forming vivid mental representations of abstract mathematical concepts - mental images that soon turn into an illusion, eclipsing the human origins of mathematical objects and endowing them with the semblance of an independent existence" (see here). If two atoms collide, it creates an event in time. While the atoms proceed through this event and on to others, the event goes the other way. First it is in the future, then in the past. This relationship prevails at every level of complexity. The rotation of the earth, relative to the radiation of the sun, goes from past events to future ones, while the units of time/days go from being in the future to being in the past. To the hands of the clock, the face goes counterclockwise. So which is the real direction? If time is a fundamental dimension, then physical reality proceeds along it, from past events to future ones. On the other hand, if time is a consequence of motion, then physical reality is simply energy in space and the events created go from being in the future to being in the past. Just as the sun appears to go from east to west, when the reality is the earth rotates west to east. So physical reality goes from past events to future events, but the information it creates recedes into the past. Since energy is just moving around, previous information is constantly being recycled by and giving structure to the present, as the energy by which it is recorded continues on its path. Rather then the straight line of a dimension, time is a loop, where the new is being woven out of strands pulled from the past. The polite reaction has been that this idea may make superficial sense, but physics is not intuitive. I would say that it is the notion of time as a line that is intuitive. It was Edgar Allen Poe who first proposed space and time as one and while there has been much complex math developed to support time as dimension, complexity isn't evidence of proof. Time as consequence of motion means it has more in common with temperature, then space, which certainly is not intuitive, but it is logical, since they are both descriptions of and methods for measuring motion. One of the many anomalies of modern physics is that quantum uncertainty seemingly leads to multiple realities, but if it is information going from future to past, then it is the wave of future potential collapsing into the order of the past. Is this 50% of the time or 100%. One "list of names" against another? Then at some point, Hooft, Heisenberg or even Hawking would have realized their mistake? 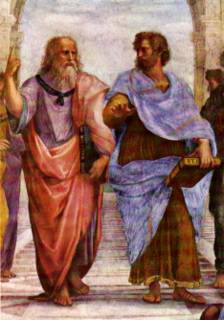 For instance, one main version of mainstream philosophy of mathematics is Platonism. It says that all mathematical objects, entities, or whatever, including the ones we haven't discovered yet and the ones we never will discover-all of have always existed. There's no change in the realm of mathematics. We discover things, so our knowledge increases, but the actual mathematical universe is completely static. Always was, always will be. Well that's kind of conservative, you know? Fits in with someone who thinks that social institutions mustn't change. Pg 3. I really do not know how he arrived at that conclusion. I knew Lee Smolin would be thinking along the line of speakers being demonstrated? Let's take symmetry for instance. Andrew Thomas:To sum up, the Platonists' claim - that certain mathematical structures which play dominant roles in our physical reality have an exalted position in some Platonic realm - does not really stand up to investigation. It's easy to get fooled by beautiful, complex mathematical structures. And when "real" objects (such as humans and computers, or any physical process) come along they can endow an illusory, deceptive reality to those structures (such as the Mandelbrot Set). It's easy to get taken in and entranced by this "grand illusion" (read Stanislas Dehaene on the cognitive illusion of mathematical Platonism here). Okay Max made a mistake with the soccer ball universe :), but that's not what the interpretation is there for when Plato's points his finger up. Raphael even back then, understood the conflict. A dualistic approach under the auspice of the arch, about the heavens and what is before us, as Aristotle holds his book in his arm while the hand gestures to "here." It would not be to uncommon to think that the heavens would have been "the mind's ability to be able to discern what already exists" by becoming aware? Jungs interpretation of the collective unconscious would not have seemed so far fetched, thinking that the "idea" had already been thought about at least once. Maybe, that is the resignation to "no social change?" This is non-trivial in the sense that MUH would imply that all about nature can always be described by mathematics. However, it doesn't excite me much because it seems for all practical purposes impossible to falsify. I could go and argue our failure to quantize gravity/to deterministically describe the collapse of the wave-function/the initial state of the universe could be a 'failure' of mathematics? How could we tell the difference to us just not having found (discovered or invented?) the right theory? Besides this, there is another point that I just don't understand about MUH: how do dimensions like mass or length come in there? In a certain sense that was for me always the difference between maths and physics: dimensionful constants. Where do they come from in MUH? Thanks for letting me know about the reply letters in NewScientist, I missed these. Yes, it seems they are equally sceptical. I have had a look at your writing, this is really a great essay! (Now I got Arun's joke with the Pie in the Sky). I am not sure whether I'd call it a 'cognitive illusion' but as I've tried to express above, one surely has to take into account that all we come up with *is* filtered through our brains, so how can we possibly claim to know how something (everything?) looks without human baggage? I don't know what is there to interpret? I have cited the same paragraph in my post, Tegmark clearly states: “The MUH leaves no room for ‘initial conditions’, eliminating them all together.”. Whether you call that 'disposal' of initial conditions or not is up to you. You say "What I think he is saying is simply this: since the world is mathematical, it cannot have come into existence in a "random" way. Therefore, what we call the initial conditions of our Universe must be *deducible* from the mathematics of a [correct!] theory of that universe." I would say in MUH the world 'cannot have come into existence in a "random" way simply because it did not 'come' into existence in any way. It just 'is'. The initial conditions of our universe must not be deducible from the mathematics inside this universe, and I don't think this is what he is trying to say. This is the whole problem with the initial conditions: that you can not derive them from the theory inside your universe. Take the common example (it might also be in the paper, forgot) GR as the 'mathematical structure', the 'theory within our universe'. It has a lot of solutions. You need initial conditions to specify which one we are in. Now Tegmark says instead all these solutions are 'real' because they are mathematical, it's just only one of them that corresponds to our universe. In this sense, he has gotten rid of the initial value problem. As I think he writes somewhere in the paper, claiming that all solutions are real kind of avoids the problem to explain why only one is real. However, instead you then have to specify which solution we are in. So I don't really see what's the advantage of doing that. The block quote should be activated in the comment section. His argument appears to start from the notion that there is a dualism of logical and mathematical truth on the one hand and physical truth on the other; this dualism usually regards logical and mathematical truth as the more basic. He then seeks to abolish this dualism in the most difficult way: taking the logical/mathematical world as the real one, but without casting any light on what the nature of this entity is. There is an interplay(arch) here that must be understood. Now as abstract as this may seem it is really quite easy to understand. You might get "some idea" of Brian Greene's thinking? You see? The "intuitive leap" is a fundamental "aha part of our intense mental work" and is not, "the cognitive illusion" that one might have you believe? There is a greater cognitive understanding in that "one moment," and sometimes, jokes, have this way of being translated very quickly. Make an inductive generalization through an intuitive leap. Call it a hypothesis. Intuition sometimes leaps the wrong way. How can it? Call it cognitive illusion or the aha-part of mental work. Explain me why your leap is a useful generalization: call it science. The infinite regress is "self evident." That is the basis of knowledge. From that "point" some idea had to enter. It's where those ideas come from, that one would come in contact with the "universality?" From that "point" some idea had to enter. "1. The ERH implies that a “theory of everything” has no baggage. 2. Something that has a baggage-free description is precisely a mathematical structure. Taken together, this implies the Mathematical Universe Hypothesis formulated on the first page of this article, i.e., that the external physical reality described by the TOE is a mathematical structure. 1. Pink underwear exists and it exists independently of whether my husband likes it. 2. Something that exist independently of whether my husband likes it are tax laws. Taken together this implies of course not that pink underwear is described by tax laws. Now replace 'whether my husband likes it' with 'free of human baggage', 'pink underwear' with 'external physical reality' and 'tax laws' with 'mathematical structure'. Given that the whole article is about mathematical logic, I find this very depressing. Yes, one could just have hypothesised MUH is true, as I said above I don't even dislike the idea, but the argument that leads there is just a cloud of fog (or as Arun put it a Pie in the sky). Maybe it is indeed possible to make the argument more strict, but I doubt it. Yeah, but more seriously, when Max Tegmark writes that If you believe in an external reality independent of humans, then you must also believe in what I call the MUH, I cannot follow him - there is a big leap of faith over quite a lot of subtle and murky details involved, as you have explained very clearly. Thank you! Bee said: "I would say in MUH the world 'cannot have come into existence in a "random" way simply because it did not 'come' into existence in any way. It just 'is'. The initial conditions of our universe must not be deducible from the mathematics inside this universe, and I don't think this is what he is trying to say. " "This is the whole problem with the initial conditions: that you can not derive them from the theory inside your universe." How do you know? Maybe we just don't know how to do it yet. Maybe the internal mathematical consistency of the theory demands that it start in a particular way. Think of the initial conditions for Maxwell's equations: you can't just have any old thing, the initial electric field and charge density have to satisfy divE = 4.pi.rho. This is an example of what I mean. True, what you say would actually be more interesting. As I've written above, I don't think it is impossible to 'deduce' the initial conditions from inside the universe, but this is not quite the same problem as Tegmark tries to address. He tries to answer the question: even if we knew them, then why these initial conditions/laws? And his answer is because they all exist, somewhere in the Level IV multiverse. Your example with Maxwell doesn't quite work, also here you need to specify the initial conditions, Dirichlet, Neumann... Even if you know the current is actually described by a fermionic field, you are then stuck with the Dirac equations. The point is that there are many solutions to div E = rho. As long as you are dealing with differential equations, you always need initial conditions to get rid of arbitrariness on the solutions. Sure, not all initial conditions are actually possible, and thus not consistent (you can easily have too many). Either way, us doing physics with differential equations is tightly connected to how we perceive the world around us. That's why I wrote above, I can imagine the universe being described by maths, though not a differential equation. I was trying to think of an example. The "E8 design" is mathematically pleasing, it is also fraught with a lot of complexity. The "dimensional perspective" of that symbol, is a condensible result of "something beyond it." We do not know the limitations of what already exists? The mathematical structure "is" just part of the universe? There is "no outside" for the "outside is the inside." The inside/outside. The Klein bottle would be an apt comparison? It "symbolically" encapsulates the argument? Even Veneziano's concepts brought the realization that even if we push back our perspective back to the origins of our universe with string theory, there was an important feature of it that was expressible, and contains the analysis of "Max's ideas" about the mathematical structure of the universe. Your logic is having a hard time dealing with Max's proposal. I do not like to venture where your husband has gone topically above :) so I'll leave that, and consider the more detailed/condensible version quoted before. Detailing the mathematical structure of your argument, is exactly what Max is doing? :) Maybe I am just trying too add a "new dimension" to the topic? Surely the observational signature of a sufficiently complicated mathematical structure could be - perhaps even with high probability - identical to a random mess. Then how, in practice, could one tell the difference? And isn't the number of simple mathematical structures much smaller than the number of complicated ones? Good analysis. I have to admit that although I found the paper fascinating when I first read, after I figured out that he had no decent philosophical arguments for the MUH, I lost interest in the other sections of the paper besides the one claiming to prove the MUH. The temptation to confuse abstraction (the MUH) and objectivity (the ERH) is an old, old philosophical problem, and Tegmark's arguments merely commit the same old mistakes all over again. Also, the argument hinges on the truth of ontic structural realism, which is another philosophical debate that is far from resolved. Well, I guess Tegmark's answer would be there is no collapse of the wave-function. We just live in a many-worlds setting and our observation of the collapse is only apparently so, the wavefunction doesn't collapse it just branches etc. Max Tegmark here. First of all, I'm honored and flattered to see so many comments on my paper. In contrast, the boring mainstream papers I usually write typically get only a few responses, all of them being "cite me". I won't comment on posts suggesting that my paper is an uninteresting waste of time, since I understand and respect that point of view. Instead, let me just clarify two technical points. 1) Bee's pink underwear objection doesn't work. a particular example of something that exists independently of whether Bee's husband likes it is a tax law. 2) Initial conditions: Contrary to the October 14 posting, I do agree with the essence of Dr. Who's original point about initial conditions. Mathematical consistency can be a very restrictive requirement, so insisting that the TOE be a *complete* description of physical reality, including all aspects our our big bang, may well lead to some striking predictions that we don't get from merely throwing up our hands and mumbling something about randomness. From people who believe that the physical world is in some deep sense not mathematical, I'd love to hear more specific ideas about what they are proposing instead. Max Tegmark:From people who believe that the physical world is in some deep sense not mathematical, I'd love to hear more specific ideas about what they are proposing instead. I had to try and understand what "other point of view there could be," so I wonder if this would be a good topic under a new posting Bee? 1) That was exactly the point of my objection. Your argument does not work without the extra assumption that 'that *everything* that has a baggage-free description is a mathematical structure', and not just *something* (as you wrote in the paper, see quotation above). Alternatively, you could also call 'baggage-free' a definition for 'mathematical structure' but then it's an empty statement. 2) Sure, mathematical consistency can be a very restrictive requirement. But if initial conditions would follow through arguments of mathematical consistency, they wouldn't be initial conditions. The problem with the initial conditions, correct me when I am wrong, is exactly that they do not follow from the theory at hand. However, as I have written above, I actually do think it is possible that taking maths more serious on this matter can help with our current understanding. You are arguing for a multiverse that has the very property to contain a lot of 'reality' that we can not, and will never be able to, observe. I am not even sure whether it makes sense to call such a theory 'true', or things that are by construction unobservable and un-experience-able whatsoever 'real'. You can always conjecture there exists something that we can't observe no matter what, but what good is that? This also holds for the conjecture there might be something that maths can not describe. You believe reality is mathematics, I don't. You don't like my believe, I don't like yours. That's interesting, but it's not science. I don't even see why one should argue on this point as long as your hypothesis remains unfalsifiable. As I mentioned previously: if we were to observe something and would not be able to describe it with any mathematics we know, how could we decide whether it's maths that fails, or whether we just haven't found the right description? Scientific arguments aside, my reason to not believe all of reality is maths is that for me the interesting thing about maths is not that we are able to use it. The interesting thing is what Plato above called 'an intuitive leap'. Call it intuition, a believe, a hope, or a conjecture. The interesting thing for me is the capability of the human mind to observe, and to translate this observation into something more general, taking away clutter, finding the patters, playing around with them. It is the process of this translation that I find important, not the result, the language in which we formulate it. I think this is essentially also the question Olaf Dreyer has been asking in your talks here at PI, I think he asked a similar question in both talks, and I think you misunderstood the question both times. He was asking how come that we connect much more with the 'mathematical structures' on our notepads than the actual symbols contain. How come we are able to get an intuition for what these things 'do', that what makes the essential difference between mathematical proof and physics, the intuition advantage that physicists can bring into mathematics. Where does this come from? Can we ever describe this by a mathematical equation? This discussion reminds me of the debate the consciousness folks have regarding whether there is more to minds than just brains. Some people believe there is something about redness that makes it really red only if a human perceives it. Any decade now, IBM will simulate a human brain on a super computer, and if it's Bee's brain then *she'll* still wonder what reality is. At least then we'll have a complete mathematical description of a Self Aware Structure. As I understand it, the main benefit of the paper seems to be the possibility of getting a T-shirt sized TOE - something baggagy like "All logically possible realities exist - go figure your own special case". I will try to breifly clarify the misunderstandings some readers are having obviously due to a lack of comprehension of what mathematics really is. A reduction of any mathematical statement leads to set theory, any statement that does not contain a contradiction in terms of set theory can be allocated a definition. From here any mathematical statement is essentially true by REF, i.e. it is simply defined to be true (despite the reduction may be difficult). In short anything that does not contain a contradiction, or is well-defined IS a mathematical definition. Anything that contains a contradiction, cannot be true, and physically speaking cannot exist. Thus anything that exists is obviously defineable and not contradictory, thus it IS a mathematical statement, more precisly a mathematical structure. You see anything that exists or could exists is a mathematical structure (and so does exist) and anything that cannot exist is simply a contradiction. So by definition to say somthing is not maths, you are simply saying it does not exist. Some people would say maths is a language for describing truth, no thats the notation! "From people who believe that the physical world is in some deep sense not mathematical, I'd love to hear more specific ideas about what they are proposing instead." Hahahaha, lol, good one max. By Bee: "...we cant find the mathematical description"
In maths there is no such thing, if an observation couldn't be described by maths, it is a contradiction, and thus wouldn't occur or the observational equipment is flawed (furthermore that flaw could indeed be described mathematically, e.g. a crack on a lens!). Physics applies a tiny part of maths. Applied maths is VERY different from pure maths. ERH => MUH, and I would go as far to say MUH is a tautology but that would be philisophical. any statement that does not contain a contradiction in terms of set theory can be allocated a definition. [...] anything that does not contain a contradiction, or is well-defined IS a mathematical definition. Anything that contains a contradiction, cannot be true, and physically speaking cannot exist. Thus anything that exists is obviously defineable and not contradictory, thus it IS a mathematical statement, more precisly a mathematical structure. Sorry I dont think I get what you are saying. Firstly any linguistic or notational definition is always circular, there is nothing I can do about that! I think you are trying to seperate physical existence and mathematical existence, when if one is isomorphic to the other they are one and the same. when I said "Anything that contains a contradiction, cannot be true, and physically speaking cannot exist." more rigorously this means: for a mathematical strucutre (MS) a relation in it that is not a 1 - 1 mapping we do NOT have an irriduceable MS (this is why tegmark defined his relations to be 1 - 1) so there does not exist a ismorphism between a SAS's observations and this MS. I suppose we could simply define physical reality as our own eqivilence class of descriptions, i.e. our own universe. Logically the only way you can argue against this is somehow using godels work. I trust that Tegmark has somewhere a nice proof that godels incompletenss theorems dont mess it up. And I am sure it elegantly steers MUH away from russells paradox. Lastly: An 'existing' 'electron' could be defined as a set of valuations on a subset of the domains of the relations on our MS, s.t. they are consistent and complete, and the MS is defined as in Max Tegmarks paper. p.s. That last definition was off the top of my head, and it could do with some extra thought. Apologies for spelling. Well this was an interesting post from the pre-Lisi era. I personally think at the smallest bit of information you have a really small amount of physicalness and consiousness already there so the idea of invoking set theory sounds good. Getting recognizable physicalness out of set theory might be in more detailed terms like getting Lie Algebra out of Clifford Algebra. Really satisfyingly saying what physicalness and consciousness are is rather tough cause we are using that consciousness to perceive the physicalness and they are possibly both there together down at the single bit. You can't get outside of it, the way things get perceived is built right in at the smallest level perhaps. I thus would fundamentally think of an electron as a combination of bits and the wave function as a way to describe the probabilities for the many worlds paths (a bunch more bits). My understanding of the argument is that someone proposes that all of reality is mathematics or rather the realization of it. It has also been suggested that this all relates finally to set theory, as to what extent this can be considered. If this be true, then we should give up the quest for total understanding, since Godel has long ago demonstrated that there will always be statements about the system which cannot be proved or disproved within the limits of the axioms, whether they be true or not. This then implies that such prove lies outside. I then have to wonder, since the proof lays outside must not also the truth; and further suggest that since there is more to reality then mathematics, then what this forms must also be included in our description of it. So whether mathematics is real or not, it cannot be all of reality. At least this is what I would consider would be Gödel’s position if presented with this contention. Paradox is not an error; it simply suggests our understanding is not complete. Sorry I dont think I get what you are saying. Firstly any linguistic or notational definition is always circular, there is nothing I can do about that! I think you are trying to seperate physical existence and mathematical existence, when if one is isomorphic to the other they are one and the same. Well, you've done it again. If you start by saying they are both isomorphic, then they are the same. Just that you've come to the conclusion they are isomorphic by saying they are the same (previous comment). That doesn't prove anything. What I am saying is you will have a hard time 'proving' with maths that there is no property (call it 'physical existence') that can not be described by maths. The way most people understand mathematics, it is an 'language' or if you like it better a 'map' that models our real world, but without being identical to that real world. Since you like maths, if it is a map it's neither surjective nor injective. For it to be, it would have to lead out of maths to begin with (so since map is a mathematical term, maybe one should stick with model). Either way, I hope you realize that this discussion is more or less vacuous unless you define what mathematics is. If you define mathematics is reality, then yes, reality is mathematics. I believe Tegmark's paper says something about Goedel's theorem. I can't quite reproduce what, but if you're interested have a look. I thought I defined maths as "without contradiction", so did Max Tegmark, more rigorously sets and relations, that was the point of my first posts. It is physicists who model reality by applying maths. Maths is not a model, applied maths may be. Notation is the language we use to communicate maths, but maths is not a language. I must admit my written communication is poor. I hope now you see how MUH is really quite trivially true, nearly as trivial as is defining maths to be reality. What I assume the intention of this paper was is to explore the implications of this, which I found very interesting (although I do not know enough about predicate calculus to understand why godels theorems are even a problem). btw this is the same sam. Then define "contradiction" without using maths. We probe nature in many ways, and eventually we discovered that mathematics is quite an efficient way to formulate laws and predict nature's behavior. However, I see nature as a surface. Philosophically speaking, I firmly believe there is an ultimate reality "deep below" this surface. The way we most efficiently probe nature (ie, mathematically) seems to indicate only that it would be reasonably safe to infer that the ontological structure of the ultimate reality has a mathematical component. In my opinion, there is much more to the ultimate reality than our "logic of solids" can reach. Bergson's philosophy still awaits to be truthfully rediscovered and developed. Tegmark's argumentation diverges into what appears to be a naive route, not only because of the trivial equality he raises (reality = mathematics) but also because it relies on an "absolute mathematics" that we humans supposedly can have complete access. I don't believe that to start with. Furthermore, even if I did, I can only think that it would be unwise to jump to the conclusion that mathematics *is* the ultimate reality by its own intellectual merit. There is so much that we don't know, even metaphysically speaking, that the whole matter "reality = mathematics" sounds nothing more than a deprecatory, simplistic attitude, that takes us nowhere. IMHO, the triumph of the human intellect on the ontologic status of nature's laws clearly lies elsewhere. I agree with your sense that it seems rather naive to conclude all of reality *is* mathematics because we presently have no other, better description available. I find it very possible that in 100,000 years or so, people will laugh about us. Much as we would laugh about a cave-man proclaiming his just developing language is of course the best and ultimate description of all that is around him (I would think they didn't find their own paintings too convincing either). Measured on the time-scales of evolution, mankind has only just begin to unravel maths. "the human intellect feels at home among inanimate objects, more especially among solids, where our action finds its fulcrum and our industry its tools; that our concepts have been formed on the model of solids;"
On what does he base this claim? This kind of view can very easily be biased by the era one grows up in. I personally can't say I feel 'home among inanimate objects' and if you look at some current trends e.g. in architecture towards making our inanimate surrounding more organic in shape and mobility, I don't really find his assertion too convincing. I see your point, but I hope you will not conclude that the work of Bergson can be summarized by (and somewhat strictly interpreted from) that quote alone. His work is quite rich and deep, specially his notion of "duration", and I believe it is a metaphysical concept which quite independent on one's epoch. I believe much of what he wrote is yet to be explored, and the impact of his ideas in the physics arena is yet to come, IMHO. You'd have to read his work in order to put that quote into context, specially concerning his notion of "duration". In particular, I think that his claim on the "logic of solids" could be perfectly made in our time, even with increasing mobility of objects arround us. Such a "logic of solids" is to be contrasted with what would be a "logic of duration", but it is difficult for me to summarize what is Bergson's "duration" in a blog comment section, I'm still trying to grasp it, I'm not a philosophy expert. The point is: time is always something that we reduce in our mind to a sequence of "snapshots". Even mobile or organic things would ultimately viewed like that. Bergson argues that even our notion of life evolution is fragmentary in that direction. The same for mathematical laws expressing the dynamical equations of motion in which our present physics is completely based on. Mathematics is currently built on Cantor's set theory, a set of points. Now imagine a mathematics based on a set of processes. This is the route of n-category theory, as far as I understand it. It is an interesting move towards a more general mathematical framework that could lead to new physical insights. And somewhat in the direction of Bergson. "Then define "contradiction" without using maths." There is no objective defintion that is not mathematical, and strictly speaking no method of communicating a definition is without subjectivity. I lean towards buddhism in the sense that truth is only accomplished on your own and an understanding of everything is impossible. Anyway, communication is irrelevant to the validity of ERH => MUH. In a number of his papers (may be from 1998) MT puts forward the conjecture that our Universe is a “Mathematical Universe” when the “Theory of Everything” may be an “ensemble theory”. That’s correct, but the questions arisen – what is this “ensemble”? What are it’s properties? It is remarkable that Tegmark leaves out a complete and obvious existence category of 'multiverses'. Which can be described as those universes that are not in any way connected to our spacetime. They can be called 'hypothetical' universes. They are quite usefull, since anytime you do a thought experiment ("what-if" scenario's) in fact you are referring to one of such universe, and there is a abundance of them, in fact infinitely many. They have however one feature, which they share with the 'invisible elf' in my backyard: they do not exist. Apart from that, I don't think that Tegmarks metaphysical position by regarding any mathematical structure as having 'real' existence contributing to anything. The position that makes most sense to me as the one, as for example expressed by Quine, that the fundamental substance of the world is matter, which has the property that it is infinite, eternal and always in motion. The mind is not a seperate substance, but can be explained in term of matter. Matter is primary, mind is secondary. Apart from matter there are also abstract entities, like numbers and other mathematical constructs. But they do not exist in physical form. Equating physical reality with mathematical reality, imo makes no sense, they are clearly distinct forms of existence. Existence is a logical quantifier, not a metaphysical property. This quantifier asserts whether some description of an entity matches zero, or more than zero entities. That's all. Existence is therefore quite unlike any properties that entities might have, or not have. Delusion (1) Non-detectable parts of the multiverse can't exist since they must be assumed and can't be observed... Yes, they can't be observed, but their existence can still be inferred. Under certain assumptions, of course. This is nothing new, scientists infer non-observable things all the time. Delusion (2) If I am "nothing but" a mathematical structure (or nothing but a bunch of atoms, or nothing but an evolved monkey) then I don't Really REALLY exist in the special privileged way I should exist, so it can't be right... This is just intellectual Luddism. There are many cures for that, I'll just mention one: sometimes having an assistant repeat the phrase "nothing but" very loudly will snap the luddite out of this navel-gazing state. Sorry for posting anonymously, I'll fix that next time. But I am just a dilettante, so my identity doesn't really matter. I realize this post is from years ago, but I wanted to share something I wrote a while back that might shed some light on where Tegmark is coming from. It's basically an argument that consciousness is nothing but math, and I devised it before ever hearing about Tegmark, but after reading Tegmark, it fits in pretty neatly with his ideas. "My central objection to Tegmark's idea just is that it's not insightful and plain useless." If you want to be useful, go into carpentry. The hypothesis that the universe just is mathematical structure goes back to at least the Pythagoreans. It is consistent with Materialism but inconsistent with Dualism. One would think that athiests would be particularly interested in the project. A hypothesis that isn't good for anything except making a statement is one that for what I am concerned scientists don't have to bother with. You don't learn anything from it, you can't do anything with it, you can't test it, so what's the point? And, as a matter of fact, scientists don't bother with Tegmark's hypothesis. Yes, it's an ancient idea, and there's nothing new about it except mixing in the word "multiverse." I'm fairly sure that pmer's comment about carpentry and science was a joke, and pretty funny to me personally because I spent all day yesterday with a belt sander covered in dust, and yes I got quite a bit done. Gourds of water, water levels....., strings attach to neck, length of strings, weight and sound. I think Tegmark is going in the right direction but I don't think he goes far enough, I suspect 'our reality' to be a 'calculating space' to quote Zeuse that gives rise to space & time, energy & matter and thus us. To reconcile relativity & quantum theory we have to give up the notion of objective reality. We are part of a simulation, a virtual reality that booted up & created the initial informational structure we call the big bang. We can speculate what exists beyond this reality but that is a matter for metaphysics not science. All science can do is describe this reality the one we occupy & for us it's as real as it needs to be. Check out Brian Whitworths paper for further exploration of the idea that reality is virtual. Lovely discussion, I'd just like to point out that Tegmark is essentially a rigorous expression of Ontic structural realism and mathematical monism. What a lot of people don't seem to realise is that if you dont like MUH then you are essentially a dualist; you must believe that existing things have certain mathematically describable properties and also certain properties that are indescribable (thingyness! existenceness!). You must be a mystic, basically. Personally I look through the progress of string theory and loop quantum gravity and find myself saying "where's the *stuff*?" 1- dimensional strings don't sound like things at all, but mathematical objects. To those who say that this stuff isn't science, well, it **predicted** ensembles *before* the string landscape came along, so it ain't "just metaphysics". If it can successfully predict things that makes it sciencey. Oh yes, and also it answers the Big Question of why there is something rather than nothing. Note that Tegmark has now written a popular book on this topic.